Use Apk file in Mac: In the current technology of OS, apple is leading with the most complex OS. It provides you with the best and different of all, but being the different of all and differs in the consideration that no OS can run in the mac. Sometimes it happens that there is some app launched only for android but not for the mac i.e. iOS, and you want to play with that, so, buying a new device with android for that particular app will not be correct option. In this article, I’ll make you aware how to bring an APK file in use with the mac. Yes, there are 3 applications that you can use for this. Don’t forget your buddy is here who is dealing with the iOS & mac in his life & here is to help you in presenting all the possible ways to find it easy using the mac & iOS. The 3 diverse ways of coming up with the android APK file on mac are, blue stacks, ARC welder & Andy OS. Each app has slightly different work with unique features and challenges. The blue stacks app player is the clean imitator pf presenting the android world in mac. It brings you the virtual platform where the files of android can work with all the transparency. Administrative use of blue stack has been stopped from 2017 but from the part of developing the file, it is available free with some efforts of internet surfing. As started working it creates a virtual host for the mac that brings the running of google play store and any link in relation to it flawlessly. STEP 1: download and install blue stacks. STEP 2: run the program and allow it to update accordingly. STEP 3: using your google account log into it & make google play store to set up itself. STEP 4: now start adding the apps from the store or bring the APK file to start installation to the blue stacks. Some people are afraid of the replication done on their mac and think that it may cost them high, so, no issues I have something for you, the ARC Welder is the support you would need for this purpose it is just an add on to your chrome browser that can provide you full-fledged, faithful, site of developing and android desk to your mac. It functions within the browser and provide the wonderful experience of android without going through the cookied sites. The bad side of this process is that it just can only bring one android file to use at one time , rest is up to the functioning , which I personally suggest. 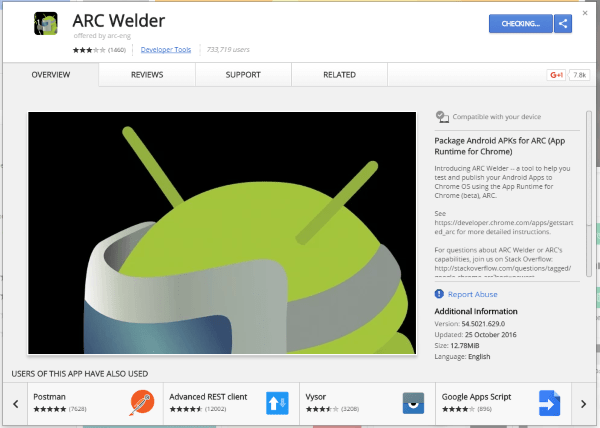 STEP 1: download and install ARC Welder directly from the Google. STEP 2: make a new folder to save APK files there. STEP 3: Open ARC Welder and click on chose when the window popups and add the APK android file. STEP 5: click on test to run the APK. An application powered by google ca provide you the delightful experience of the android world on your mac and its safe. So, if you want to test or do some experiments regarding the working of this application, then it is the right platform. Though many apps will perform smoothly, but some may create some issues as per the developer’s choice. And at the end coming up with the most effective imitator of this process, i.e. Andy OS. Andy is somewhat like BlueStack but in good processing mode. Earlier it was worst of among all 3 by stimulating more of adds and creating cookies to the browser. But presenting you is the best updated version as the downfall issue was restored within no time. I personally use this method currently and dealing with the best method mong 3. As it allows you to go with the windows computer also and can bring the android arena to your windows OS player. STEP 1: Download and install Andy OS. Ignore the popup window of Norton installer. The Andy program will automatically run and will auto-install all the requirements, you just have to see. STEP 2: after the launch of the program it will take you to the android desktop, which is to be setup by you. STEP 3: Pointing the Andy OS on the particular APK file will automatically load it. aIt is the best of all the applications that detects the APK file on its own and various webcams, game controllers and all input devices connected to the mac to make your work easy. Taking the consideration of this program being free, it still contains the full screen adds appearing timely, without complaining it works with google play store giving zero damage to your mac OS. Hence, all these 3 programs can bring the whole android world to your mac and can be helpful to the people who have keen interest in developing as these apps allow you to re-emulate the OS of the android apps to connect and play with mac, some tactics required and all is done for you.